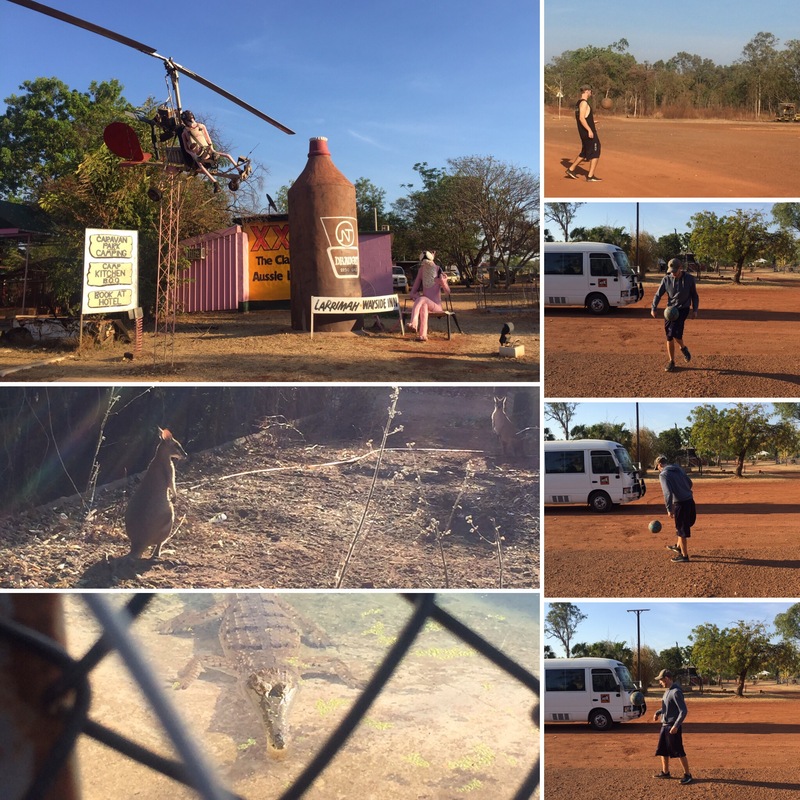 Our tour of the Outback had been amazing, but we now had to get from Alice Springs up to the north of Australia, Darwin. 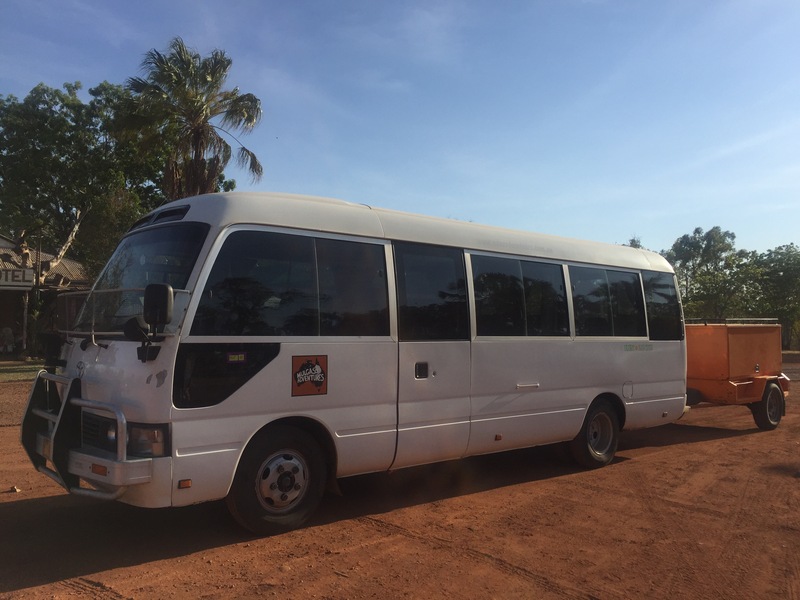 Mulga’s, who we had done our outback tour with, offers a package that includes an express trip up to Darwin. This included a few stops along the way and was hosted by our guide from the previous tour, Mark. 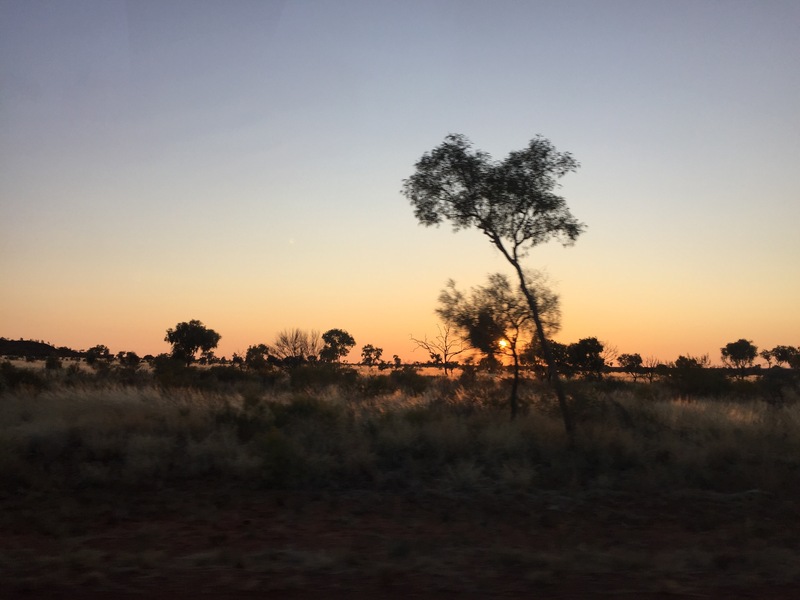 After seeing everyone on our tour for the last time at a local pub in Alice Springs, we got an early-ish night as we were up at 4:15am the next day to leave at 5am. I was actually starting to get used to the early mornings so wasn’t really tired when I woke up. There ended up just being four of us on the tour, myself and Niall, a girl call Astrid from Mallorca (originally Switzerland) who had been on our Outback tour and Leanne who had been in the hostel with us in Brisbane. It was nice just having the four of us on the tour because then we all got a double seat to be able to sleep and it meant that it was a really chilled journey. A lot of the stops we did were to get fuel because Darwin is SO far away from Alice. 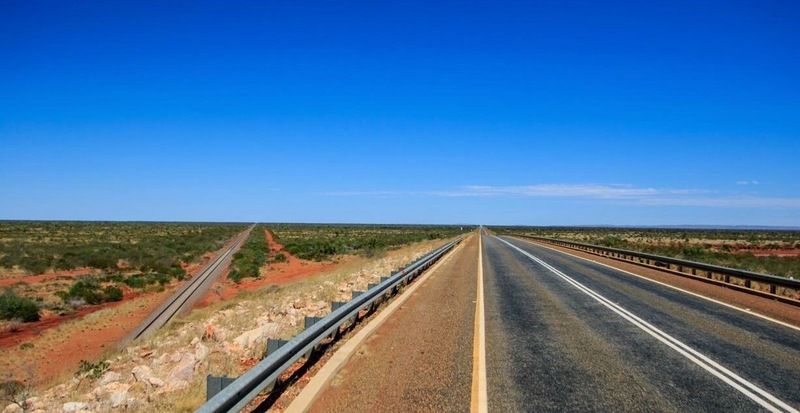 You drive along a very straight road called the Stuart Highway. There is also a railway line that runs up from Adelaide to Darwin – the train is really expensive and would be more of a luxury trip to do over a standard mode of transport. The incredible thing is how straight the railway line and roads are, it’s very Romanesque. I guess when you have so much flat, open space, why wouldn’t you make your job easier and keep everything nice and straight? 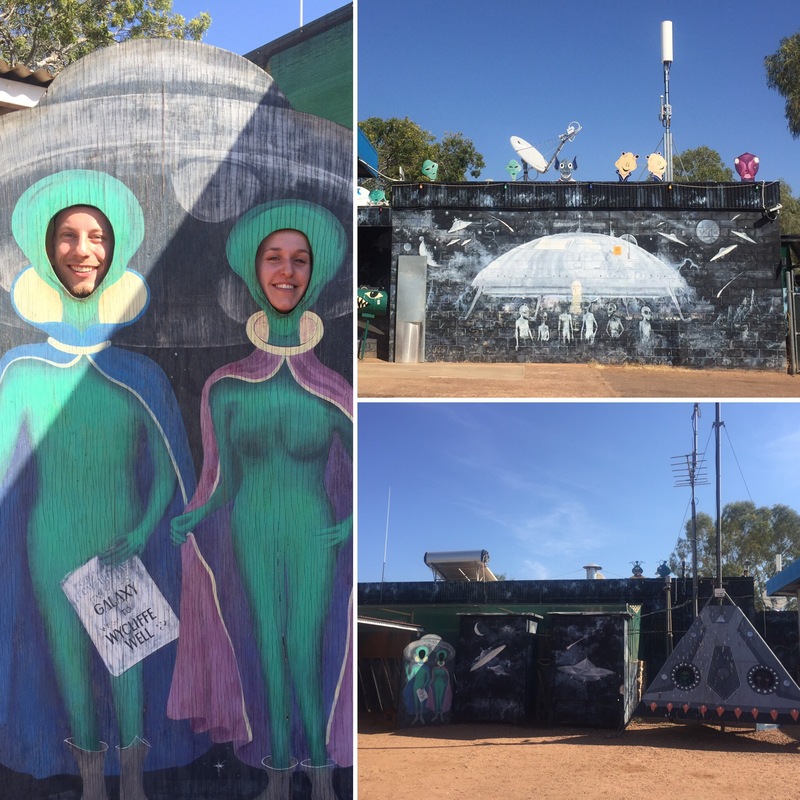 We stopped at a place famous for being the UFO capital of Australia. 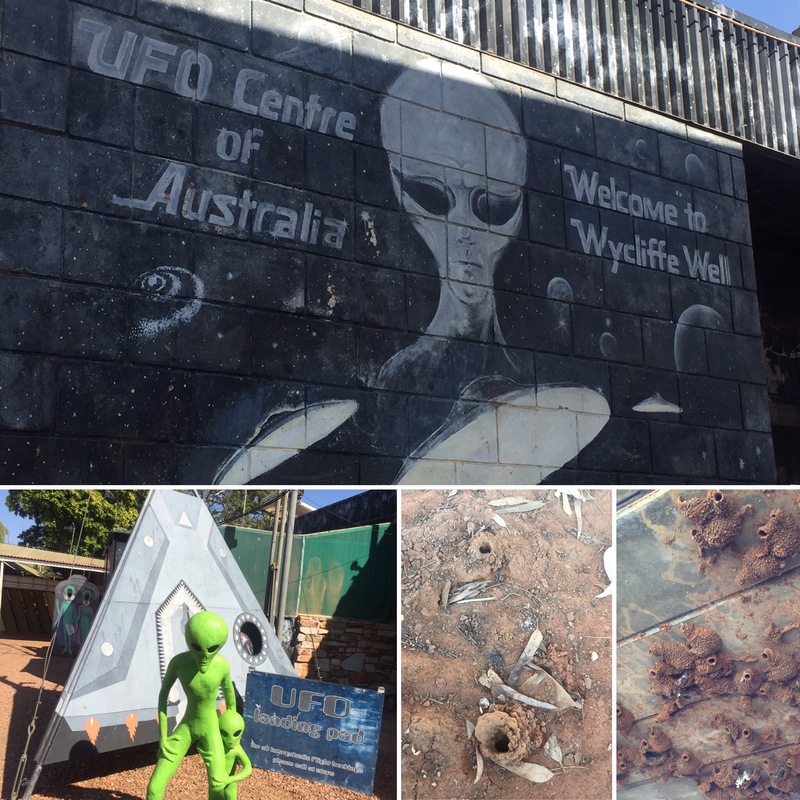 There were loads of alien memorabilia and newspaper clippings from supposed UFO sightings in the area. It was really random in the middle of the outback but I imagine it would bring some true believers to the area. Mark also showed us where a type of crab lives in the desert. The crab can go one year without food and is one of the best in the world at going without water. They burrow deep in the ground to find cooler areas and he showed us the holes in the ground where they were. He also showed us these birds (Swifts) that made mud nests underneath the bridge – we saw these at our next stop too. 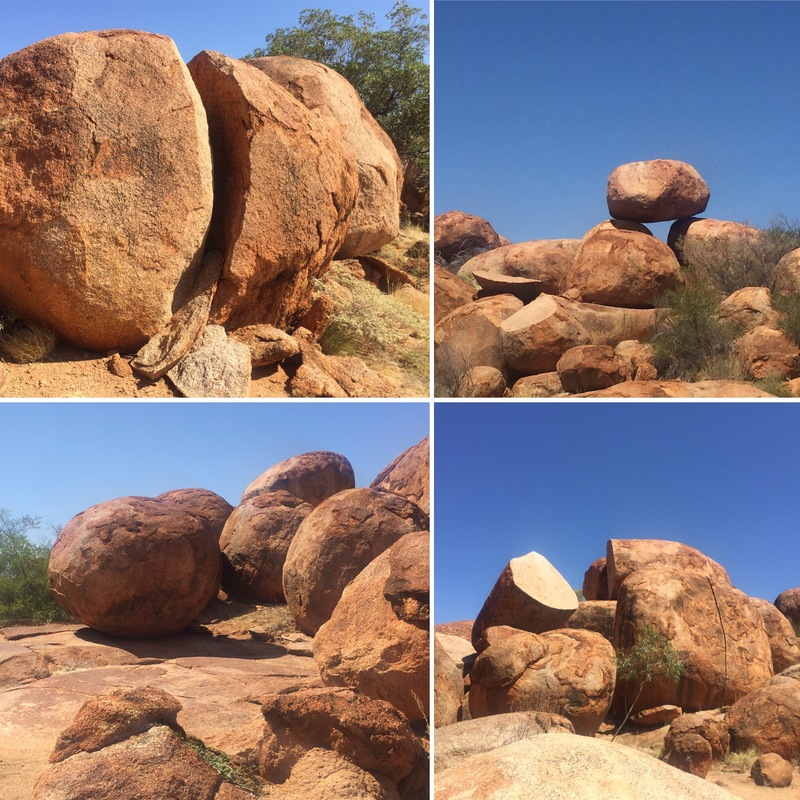 Our next stop was to Devil’s Marbles (or Karlu Karlu) which is a collection or rocks that look like they have been placed in the middle of the desert. Some are really round, balancing on top of one another and others have split in two leaving a perfectly smooth edge down the middle. It was great to walk through the rocks as they’re massive and go all the way across the landscape in front of us. Mark also showed us a range of the plant life growing throughout the area and told us about how the rocks were formed. 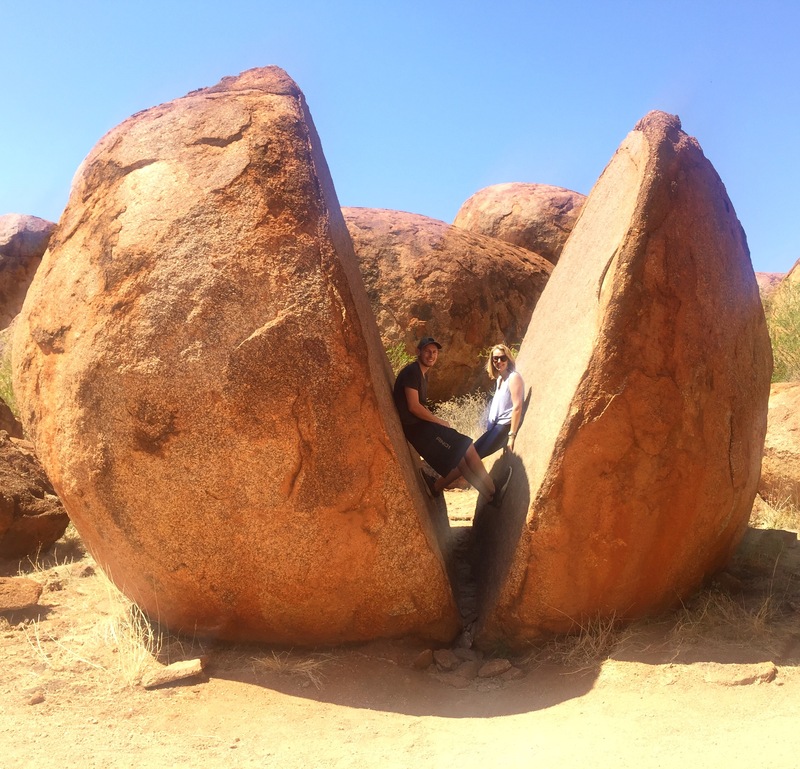 They were formed in the same way as Kata Tjuta and Uluru and the sandstone they were made of had been eroded away to leave the molten rock before which is what was cracking and peeling. As we carried on our journey we passed an enormous bush fire. It wasn’t close enough to be an issue for us but it was definitely the biggest fire I had ever seen. 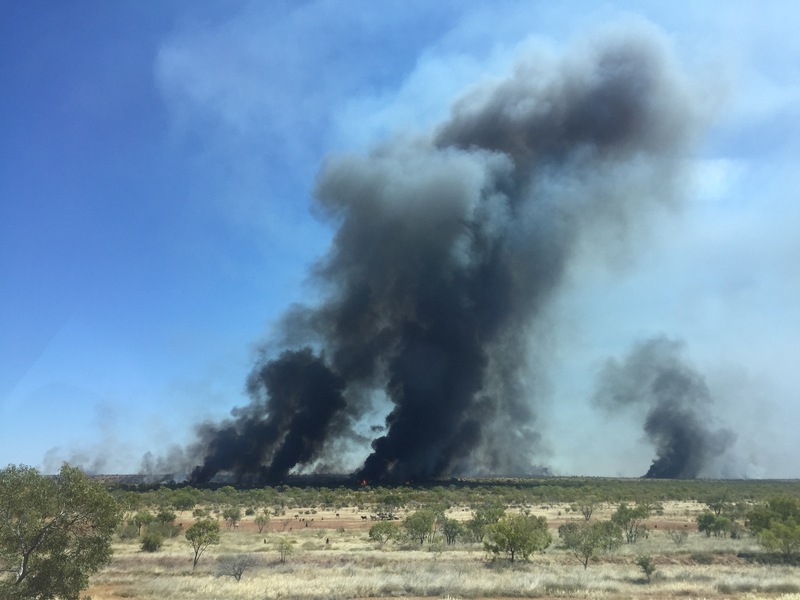 There was a large area of fire and black smoke running all along the bush and the clouds of smoke could be seen for miles. Mark told us that fire was really important for a lot of plants in Australia and that many only germinate once exposed to the intense heat. It also allows for the ground to give itself new nutrients to promote further, new growth. 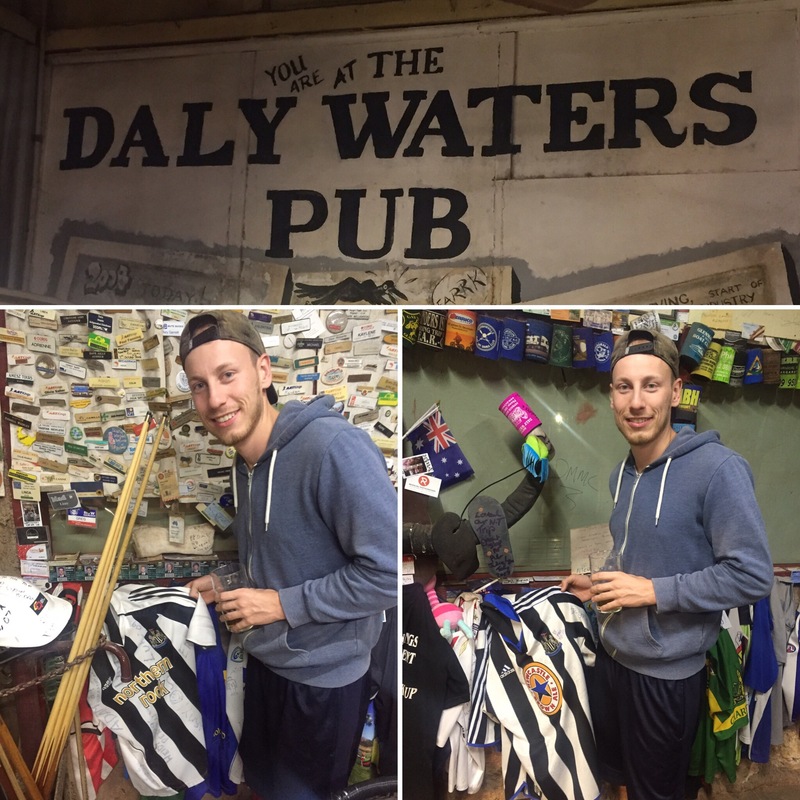 We spent our night in Daly Waters which is a campground/pub in the middle of nowhere. 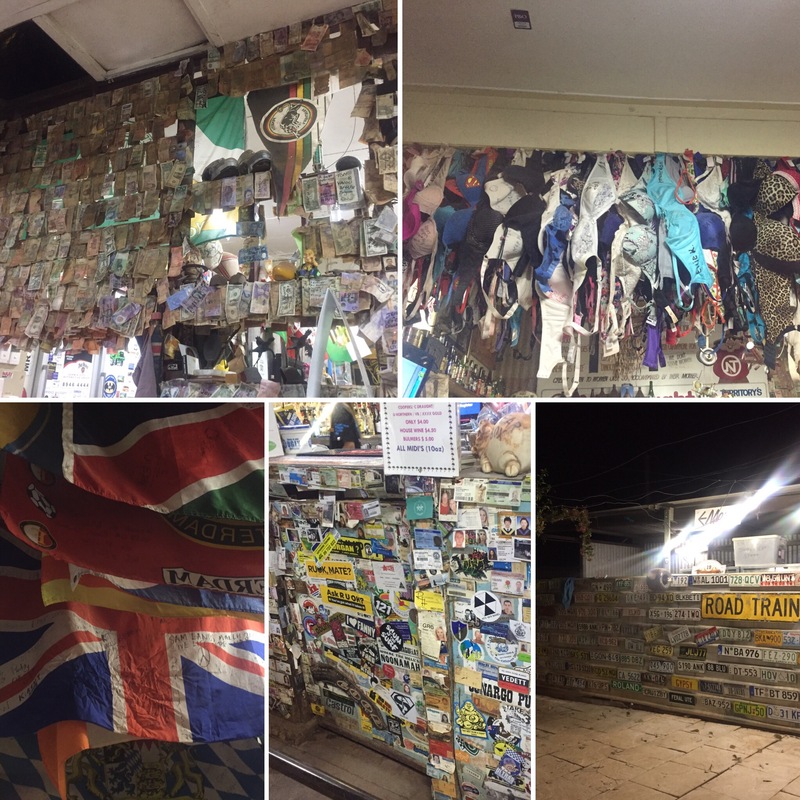 You can leave an item of any description in the pub and it’s become a bit famous for that – there are bras, different types of currency, caps, flip flops (or thongs as Aussie’s call them) and football tops. We found two Newcastle United tops left there! The place is really cool to look around for the amount of stuff there is. Mark also gave us a night time tour of the old police station with the jail cell out the back – all super eerie in the pitch black! We had our tea here which was really good food and there was a man who sang songs and told jokes while we ate. Apparently he does the same set list every night so it must get so boring if you worked there! We left at 5.30am to get a start on the 600km drive we had to do that day (we had covered around 950km the day before)! We stopped a couple of hours into the journey to watch the sunrise on the side of the road. There was only a car every so often so it was really peaceful just listening to the birds waking up as the sun came up over the horizon. The journey wasn’t as uneventful as we had all hoped for. Not long after the sun came up, we had some trouble with one of the fan belts on the bus. We had to pull into a place called Larrimah which is essentially just a caravan park now but used to be a World War Two hub back in the day. Mark knew a lot about cars so it wasn’t long until he got hold of the company’s mechanic on the phone and together they worked out what to do. It turned out to be the fan belt for the air conditioning, which made the journey slightly more uncomfortable than it should have been but at least it wasn’t anything serious that would have meant we would be stuck in the middle of the outback. We were delayed by around an hour but he got us back on the road really quickly so it didn’t affect any of our days. 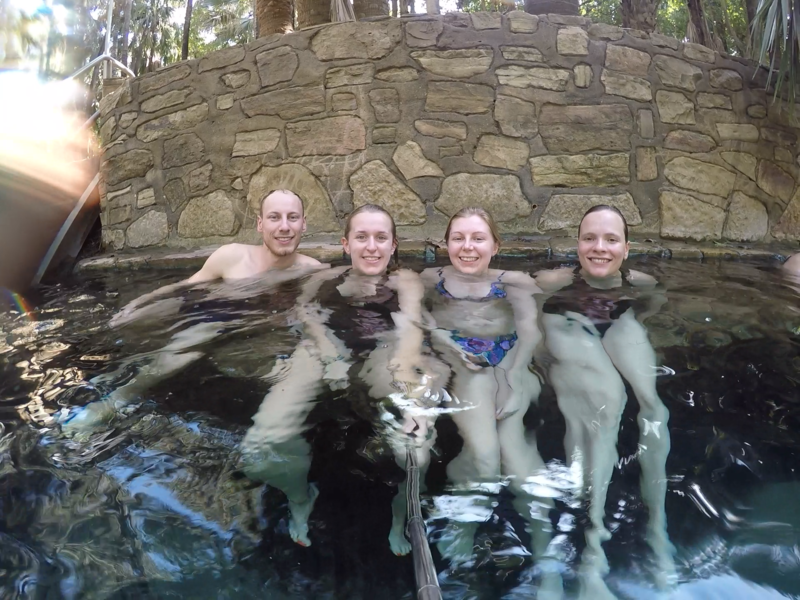 Our first official stop of the day was to the Mataranka Thermal Pool in the Elsey National Park. These pools pump out around 30 million litres of water every day and are at a temperature of around 30-34 degrees. 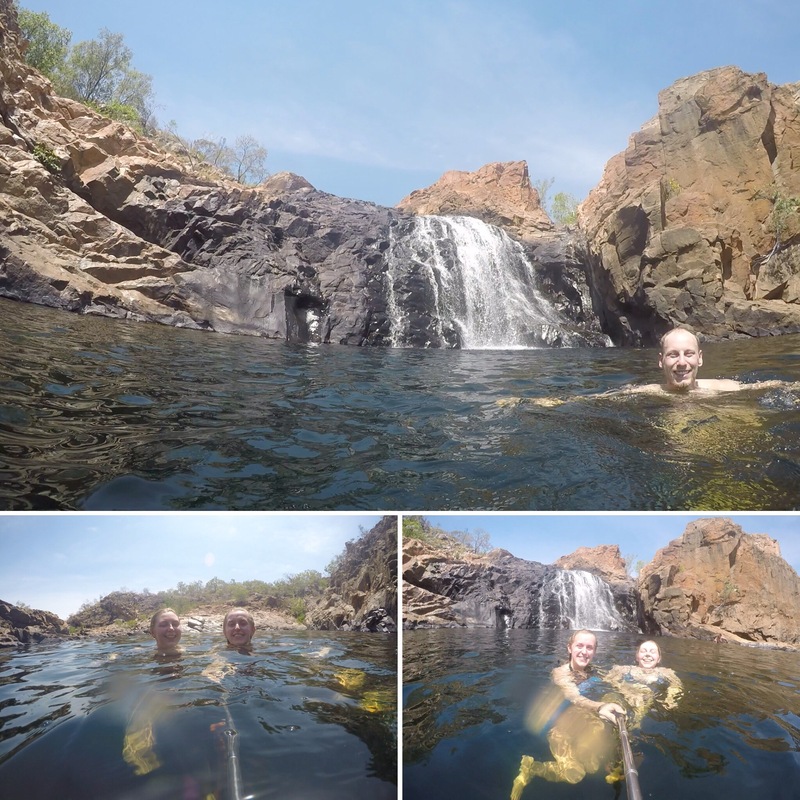 This was a popular stopping point between Alice Springs and Darwin during the war for soldiers until the more elite offices took it over and stopped the common soldier swimming here. 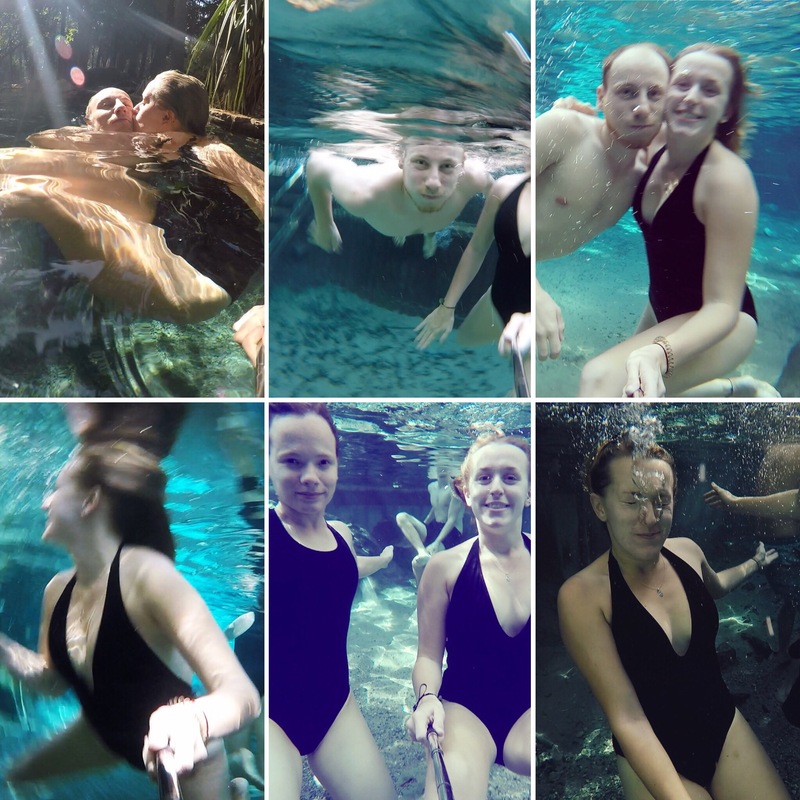 It was the perfect temperature for relaxing and swimming and the clarity of the water was incredible. You could see perfectly when you looked into the water and even when you opened your eyes under it. 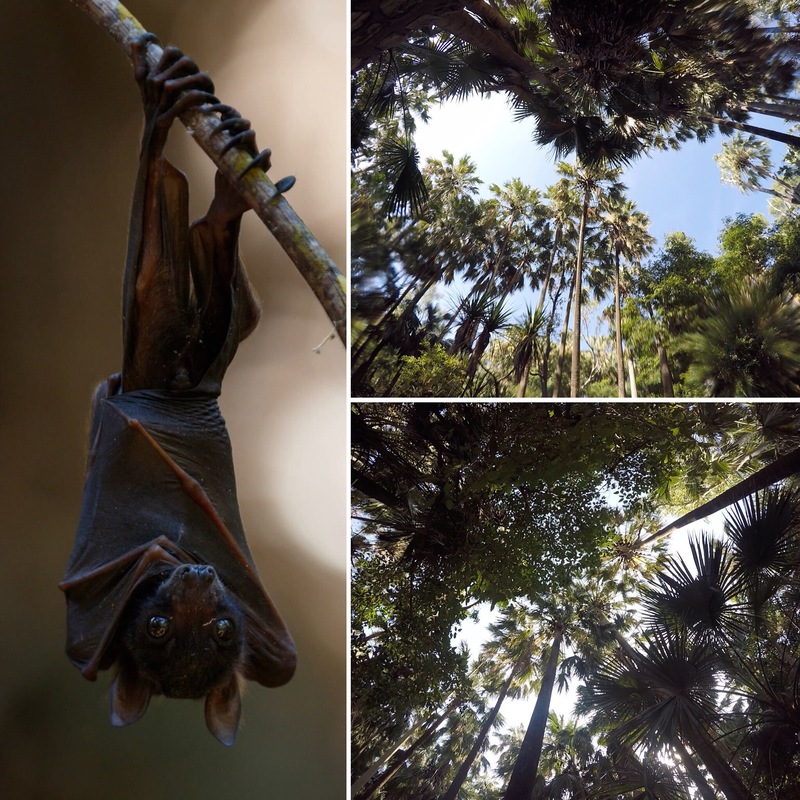 What made this place even more impressive was that it was in a jungle which was the home to thousands of flying foxes (a species of bats) which just made it all more lush and tropical. 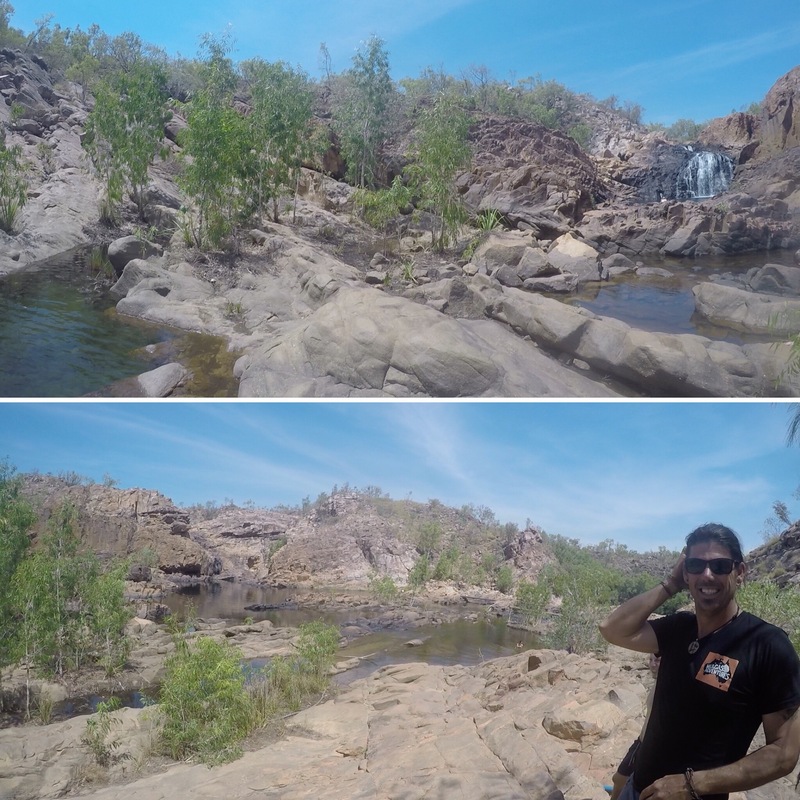 Our next stop was to Edith Falls in the Katherine Gorge. 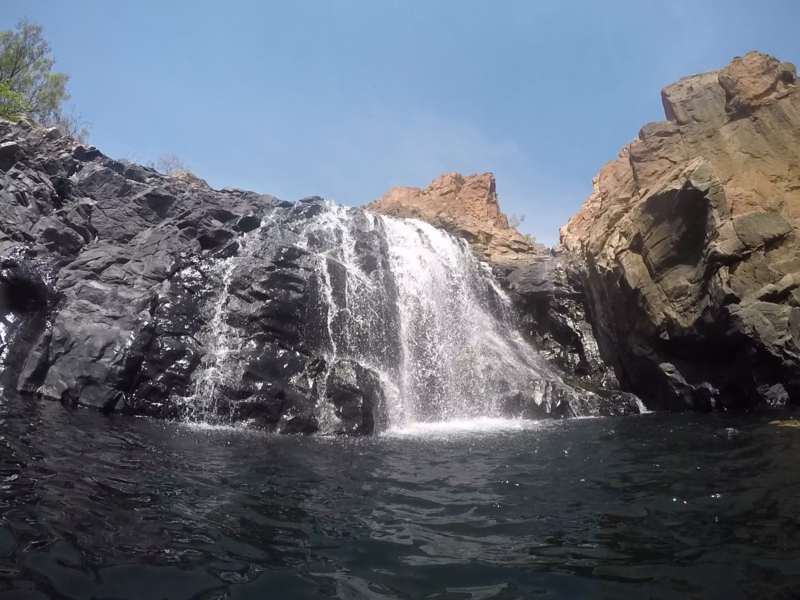 This has a waterfall and a swimming hole which was so refreshing after the 1km uphill walk to the main pool. The rocks to the main swimming hole were quite slippy but it was lovely and relaxing once you were in the pools and you could even go behind the waterfall which was fun. The water was really fresh too and there was hardly any people there so we pretty much had it to ourselves! We mainly drove after that as we had a long distance to cover. 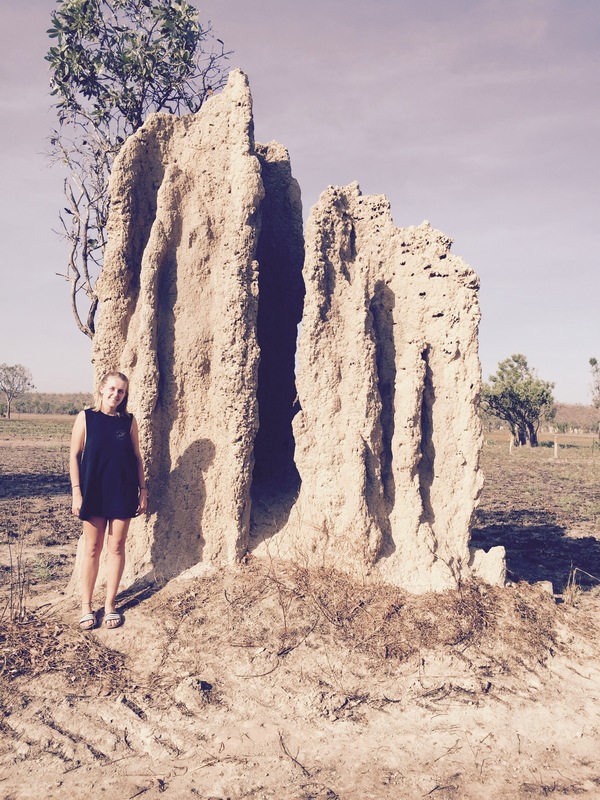 We passed loads of termite mounds so we stopped next to a particular big cathedral termite mound which was around twice the size of me. Nature really is impressive! Mark told us that we had travelled 3000km in the past 5 days since starting the tour in Alice Springs which just blows my mind really, especially as that means he’s driven all that and is then driving back down to Alice Springs before he gets a day off so who knows how much that will end up being! 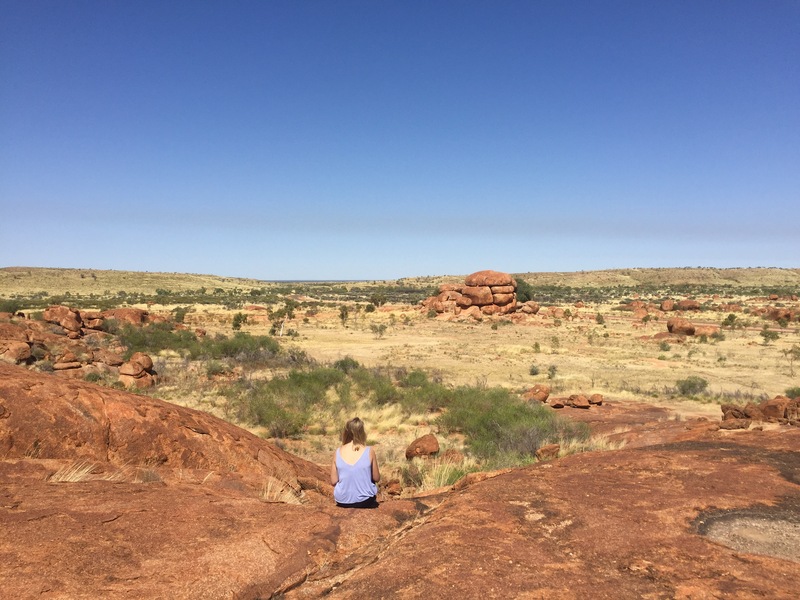 I wouldn’t really call the trip from Alice Springs to Darwin a tour, more an embellished transfer, but I’ve still really enjoyed it. It was really nice just having the four of us on the bus and it was good to see the few spots we went to on the way up. 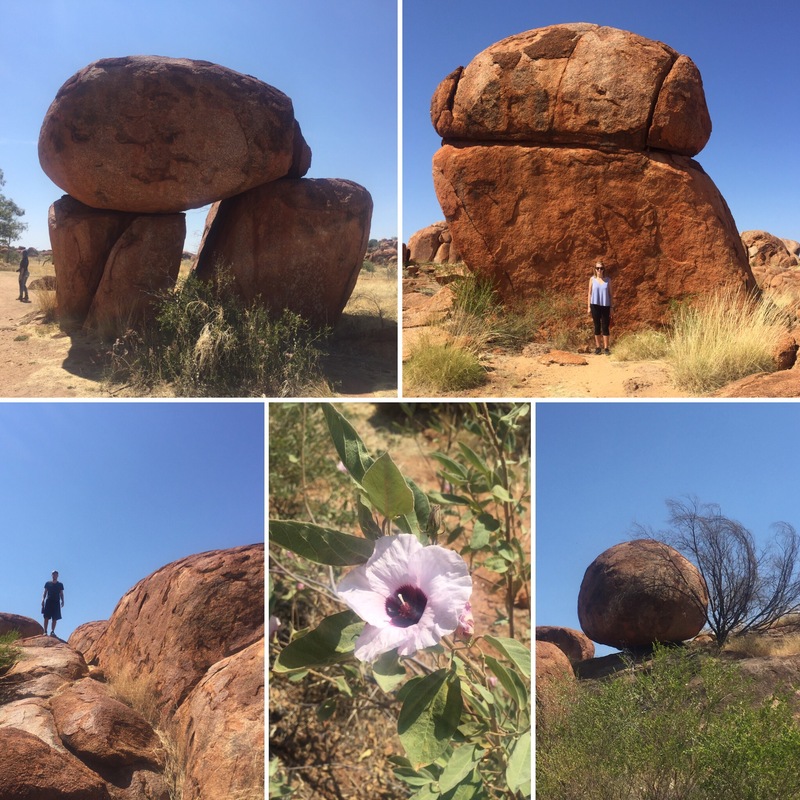 The Red Centre and what we have seen of the Northern Territory so far is just incredible and full of surprises. It definitely beats just sitting on a bus non-stop for all that distance!